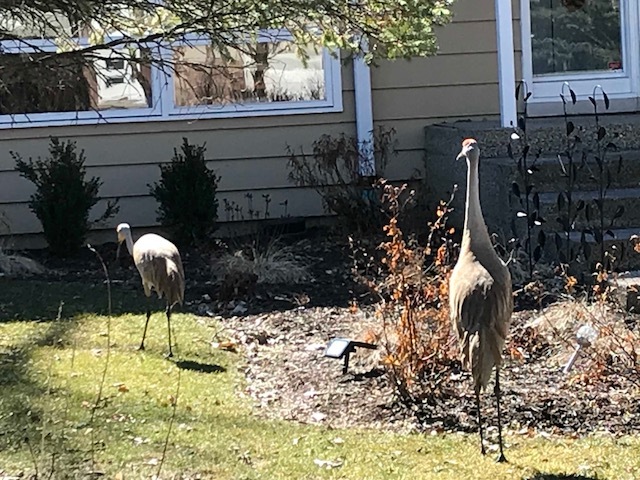 HIGHLAND PARK — A pair of Sandhill Cranes found a favorite lunch spot in north Highland Park recently. The large birds were seen walking down a street in north Highland Park in the early afternoon March 17, eating from lawns on the north side of the street before going to the south side on their return trip. They returned at approximately the same time March 18 and March 19, according to neighbors in the area. As they walked through front yards, they were followed by a caravan of automobiles with drivers and passengers taking photos from car windows. Though a 41-year resident of the area said she has never seen one in the neighborhood, Jim Anderson, director of natural resources for the Forest Preserve District of Lake County, said they are not uncommon to the area these days. 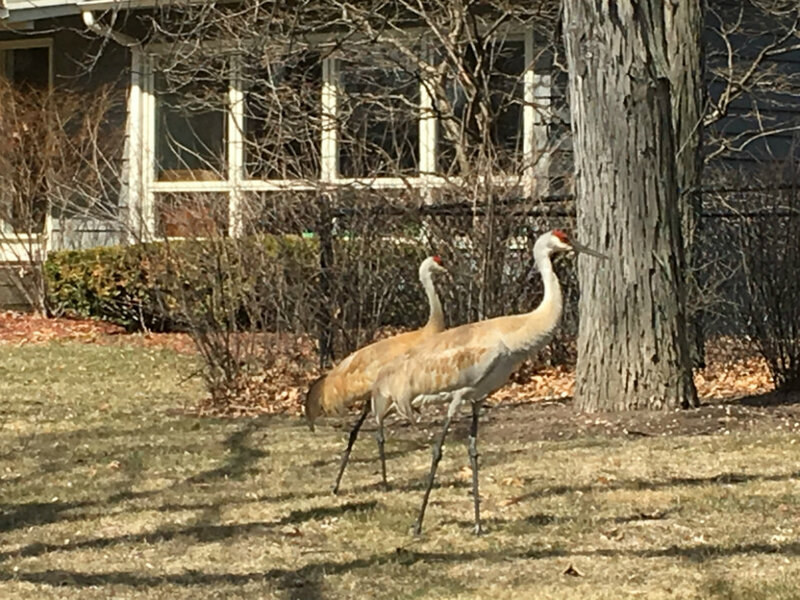 Not a lawn ornament: Sandhill Cranes take a lunch break in north Highland Park. Anderson said the birds were removed from the endangered and threatened species list in the last five years and are becoming more noticeable in Lake County. They usually nest in wetlands near water and travel for food. One of the reasons the Sandhill Cranes are more plentiful in the area is because there are more open lands, according to Anderson. He said 20 percent of Lake County is now public land. They tend to like agricultural areas because it is easier to find food. The birds can stand as tall as four feet and have a wingspan wider than five feet, according to the Audubon website. Anderson said when it is time to nest they are monogamous. “They migrate in (flocks in) the hundreds of thousands but when they nest they go with their mate of a number of years to the same spot each year,” said Anderson. Spending their winters in Florida, Texas and Mexico, Anderson said, they travel as far as northern Canada before returning south. He said the birds are in the area because it is time to mate and raise their young. They also have a mating ritual. “If you can see them dance it will be really cool,” said Anderson. Anderson said there are some who still believe the birds should be on the endangered species list. Though they are more plentiful, their nests, which are usually near water at ground level, are subject to predators. “Small mammals like raccoons and skunks will go after their eggs,” said Anderson. The more common place for the cranes is Nebraska where “they blacken the sky” when they fly, according to Anderson. They are named for the Sandhill foothills along the Platte River in Nebraska, according to the website.